Anubis was the Egyptian deity of cemeteries and embalming as well as the protector of graves. As with any other culture or religion around the world, the Egyptians believed in paying respect to their dead. Therefore, they conducted elaborate ceremonies and mummification processes to help the deceased pass smoothly into the Afterlife. Anubis was the deity who played an important role in this journey. 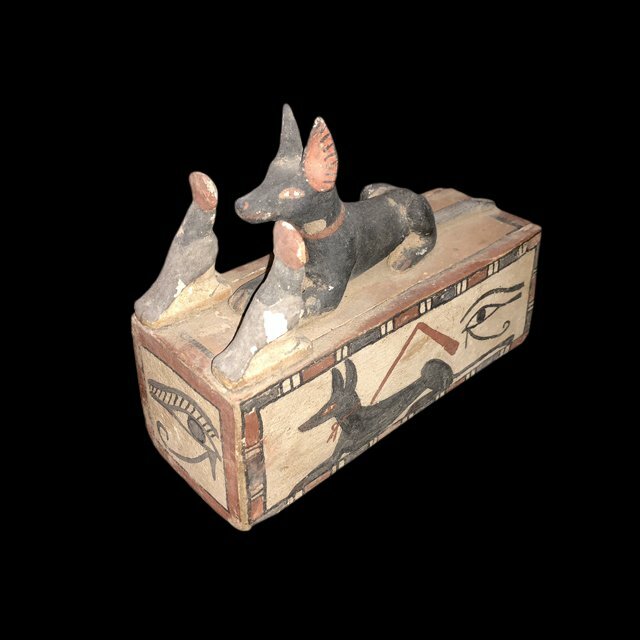 Depicted with the black head of a jackal, Anubis helped mummify Egyptians when they died. Black represented the fertile soil of the Nile that was needed to grow yearly crops, so the Egyptians believed that the color black symbolized good fortune and rebirth. Jackals were associated with death, because they lurked around cemeteries and would eat decomposing flesh. Therefore, by making Anubis the patron deity of jackals, the Egyptians hoped to protect the bodies from being devoured. In addition, as recorded in the Book of the Dead (better known as “The Book of Going Forth by Day”) Anubis’s other job was to stand in the Hall of the Two Truths and weigh the hearts of people seeking judgment. The human heart was balanced on the scale against Ma’at’s feather of truth. If the heart weighed more than the feather, the person’s identity would essentially cease to exist: the hybrid deity Ammit would eat the heart, and the soul would be destroyed. But if the heart weighed the same as the feather, the deceased would pass through the underworld (Duat) and into the Afterlife. Since the Egyptians believed in the concept of Ma’at, which meant order, peace, and balance, death was regarded as importantly as life. Therefore, Anubis was a major part of the transition from life to death and back to life again.